Torrential rain bring it! the drencher pants work Great as stand alone rain gear or in a system layered approach. Drencher gear will keep everything on the inside warm and dry, while repelling rain, sleet, and snow. 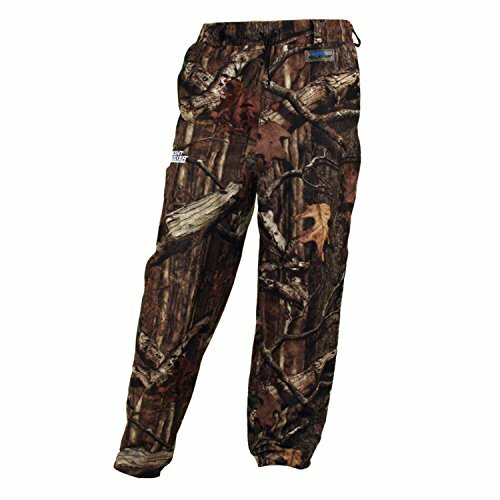 The drencher pants are constructed of quiet, soft polyester brushed tricot. The outer fabric is treated with a water repellant hydrophobic coating which forces water to bead up and roll off the surface of the fabric. It extends the saturation point of the fabric and allows you to stay comfortable and in the field longer. The pants feature Rain Blocker technology with waterproof, windproof, breathable technology which is impermeable to outside moisture, while allowing perspiration from the inside and dispersing it through the membrane system. Garment seams are heat sealed and secured with waterproof tape. The material is treated with S3 silver anti-microbial technology which helps to inhibit the growth of odor causing bacteria. The pants offer an elasticized waistband with snap fly closure and belt tunnels, front slash pockets, knee shaping for better fit, and adjustable ankle cuffs with snap closures.